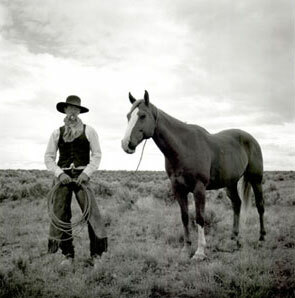 Cowboy culture is based on skill, historic values, and honor. Life on the range is not about owning objects, it's about keeping Western traditions alive: independence, individuality, and the freedom to roam. Darrin Pfeifer is a traditional buckaroo, a cowboy from the Great Basin Range, which encompasses parts of California, Nevada, Idaho, and Oregon. Buckaroos distinguish themselves by their open-crowned hats with short, flat brims, their silk scarves, chinks (shorter leather chaps), high-heeled boots, dark wool vests, and white, long, button-down shirts.